High res version of the poster available here. Cocoa temple, a track in Val Verde, a south American country with ancient pyramids and massive jungles. While Vlj has done significant work on the rendering backend, the original work on improving the looks was actually started by Cand during the 2013 Google Summer of Code (GSoC). We have participated twice in GSoC - in 2013 and 2014. If you don't know what GSoC is: it is an initiative by Google to support and extend Open Source development. Mentoring organisation, such as SuperTuxKart, mentor students for over two months full time, and google pays the students during this time. 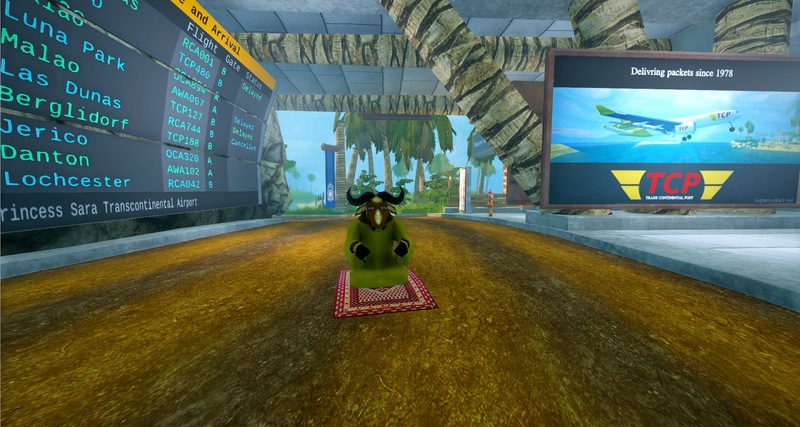 This is the first SuperTuxKart release to include the work done by students over the last two years. Besides Cand starting with a shader based rendering engine, this release also includes the work of Unitraxx (online features and voting for addons), Leyyin (improved admin interface and bug tracker for our addons web page), and Solistice (different kart physics). We also had Mcsab working on a stand alone track editor, which is included in the windows and linux binary package. Even though we decided not to participate in GSoC 2015, we have more exciting work from students in the pipeline for the next releases. While this is all very good news, the one thing we have not progressed enough with for a release is online racing. This release does include important base features necessary for online racing (like online account creation, friends, ...), but support for online racing will be added over the next release in the 0.9 series. We also recommend your graphics adapter to have at least 1 GB VRAM available when playing. Note that these are estimates and weaker hardware may be able to run the game, but perhaps not at playable framerates. You should also have at least 600MB free hard drive space, 1GB free memory, and a 1.2 GHz processor. This track will be included in the 0.9.1 release of SuperTuxKart, though additional work will be done. The package will also include some concepts art, and a special version of Cocoa Temple: "Carnival del Cocoa", the version used in our trailer. All work in the gift package is released under CC-BY-SA-NC 4.0. Any donation from our donation page of $1.00 or more (sorry, otherwise paypal's fees are too high, and we actually get nothing) will get a link to the download page for this package. For all previous donators: please send an email to supertuxkart.official at gmail dot com with the email address you used in your donation, and we will send you the link. Finally, please note that the addons website has now moved to addons.supertuxkart.net. The previous website (stkaddons.net) is now read-only. SuperTuxKart 0.9 will only support addons from the new website, so all help is welcome to port addons to the new engine and submit them to the new addons repository! Oh, before we forget - the most important point: you can download binaries for Linux, Windows (Windows Vista and newer, though we provide an unsupported XP binary as well), OSX (10.9 or newer) on our download page. We hope you enjoy this release of SuperTuxKart. As always, we welcome feedback (but please be aware that neither a blog nor twitter is the right place for bug reports or support requests, use either our forum or bug tracker for that). One of my fav tracks was Mystic Island, does anyone have it's *.blend? Maybe you should try to contact the author. That's typically the kind of track that could benefit from the new engine with dynamic lights. I would love to see Mystic Island updated to the new engine. It has so many cool effects even in 0.8.1 that would look awesome with the new engine! Would love to donate, but can we skip paypal? Could you please support bank transfer or bitcoins, too? Indeed the game also works on older graphic cards. I own the lowest-end Intel Sandy Bridge chipset (about equivalant to Intel HD Graphics 2000).The game runs okay as far as I tested. Good job! Hi! Great news... very excited! Any idea when the PPA will be updated? The only thing that I personally think you need to improve are the character animations. They are a little rough and don't feel natural. The rest is just amazing. Please, don't take my comment wrong. I love the game and I just want to do an constructive observation as a player. Keep the good work. Sorry for my bad English. Well, it is a wonderful game but, as I said when you introduce ilrich engine years ago, the difference of this kind of game is multiplayer. This game lost many years to become one of the most played game in the world. I disagree. Although it is true that STK is more fun playing against your friends, I'd argue that STK's real strength is the local multiplayer part, which works pretty well since a long time. And then, having a good looking game with some graphics effects and, more importantly, features like moving objects on the track actually improves the gaming experience more than having a networking interface. I'm happy with the way, STK set it's priorities. Thank you for your great work and congrats to this new release! I tried to report to http://forum.freegamedev.net/viewforum.php?f=16 or to bug tracker, but I do not plan to set up an account. My system is W7 Professional SP1 32bit. I have the same problem. Help me please! when i login and success online in STK, and some friend online too. i can't see the indication to see did somebody have ready select kart, will play in some track or not. only indication. "somebody online" only not when "logout". because of it, i can't prepare myself for see each other and do racing in same track. i still don't understand part "connect with friends and see when they are playing" does it mean. or maybe, in forum. we can make a booking schedule, so anyone can match a day when somebody possible stay still for meet each other in game. for example : anyone can do on sunday, have time at 7 - 12 o'clock. and then possible for make huge party there. XD. I have an Intel HD 2500 and it runs well up to graphic level 4. So it will probably work on even older graphic cards. Intel HD 2500 is gen7 graphics card (Ivy Bridge) and in theory it should have better OpenGL support than HD 3000 (gen6, Sandy Bridge). And gen6 is the bare minimum with OpenGL 3.1/3.3 support. I hope all assets in the 0.9.1 release will be freely licenced (i.e. no NC) as opposed to the gift package being under nonfree CC-BY-SA-NC. We do intend to release fully Free later. This is just a time limited situation. When I install and launch the game, the menus are working OK, but when you try to start a race or the tutorial, the game inmediately crashes. No matter what you do, it just don't load the race scenery at all. Also, the game notifies me constantly that the graphic drivers are too old, but that's not true, I have the most recent drivers available installed (my graphic card is an AMD/ATI Radeon HD 7470M, and I have installed the AMD Catalyst Drivers 14.12, the most actual version available for now!) Just don't understand, what's the matter with my graphic hardware? Thanks in advance for your attention, and have a nice day. I'm trying to run STK on Windows 7 64bits but it always crashes. I got an error about call stack. It's not smooth at all unless I lower graphic settings in stk to level 2 - which kind of dark and flat even compared to stk 0.8 !!! Most of the karts look strange : problems with transparency and see-through at unexpected places, and shadows overlay. Wow! Super fun game which keeps increasing with its releases, so congrats! I love experienceing how this game becomes more and more fun. thank you so much for your amazing work..! I'd love to donate with banktransfer, so if you guys would add that to your donate-options.. there are still people without paypal-account. Good luck with all your future ideas, I'll be tuned for whatever comes! So i have a laptop with a GeForce 840M 2GB VRAM and on level 5 graphics level i get around 30-45fps is that normal? When you are goin to release the new update? 0.9.1-rc will soon be released, hopefully within a week or two if no critical bugs show up. My graphics drivers keep crashing when playing the game. I have the same problem. Can somebody HELP please??? This is not the place for bug reports. See issues.supertuxkart.net for where to report those. However, we may not be able to do anything with misbehaving drivers, so your best bet is to try upgrading your drivers and the game itself. You could also try using Linux. I had an issue where STK would crash when bloom is enabled on Windows 10 (latest AMD drivers , even tried unofficial newer ones) and using Linux fixed it.